Nothing says Christmas like the smell of baked goods and a stroll through a Christmas market. Preferably with a cup of mulled wine or hot chocolate in one hand and cinnamon donuts in other. 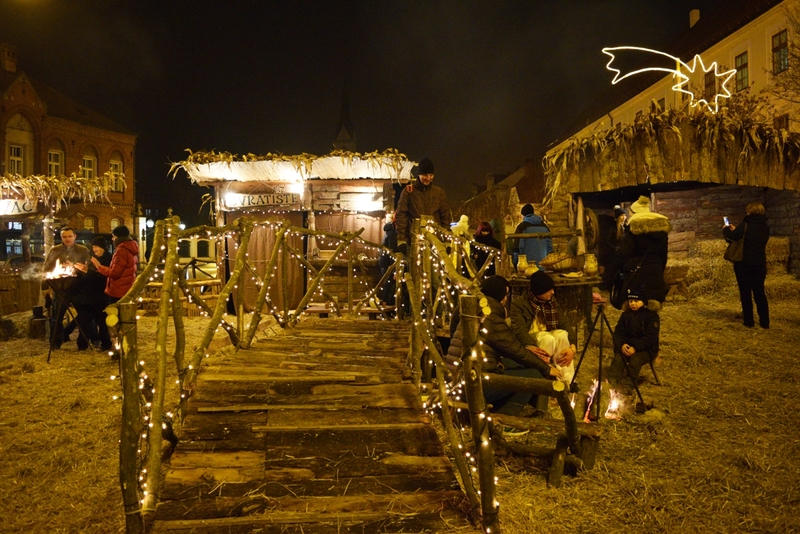 In December, we decided to check why has Zagreb been chosen as the best Christmas market the second consecutive year. 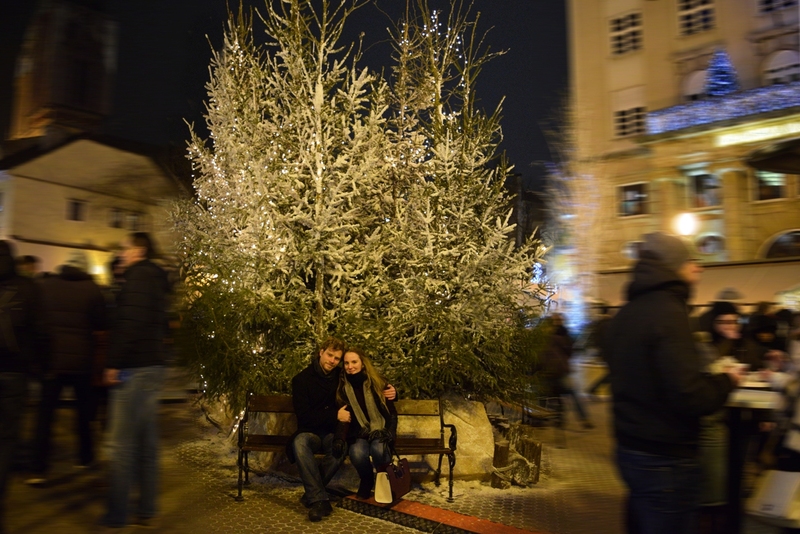 We headed to Croatia on December 23 and stayed there for one night. 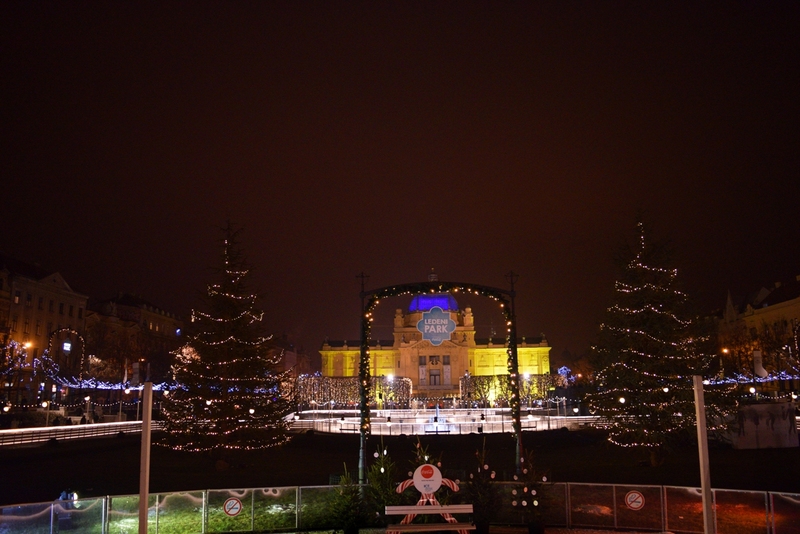 Not much, but enough to see a glimpse of Croatia’s capital city while getting into a Christmas spirit. 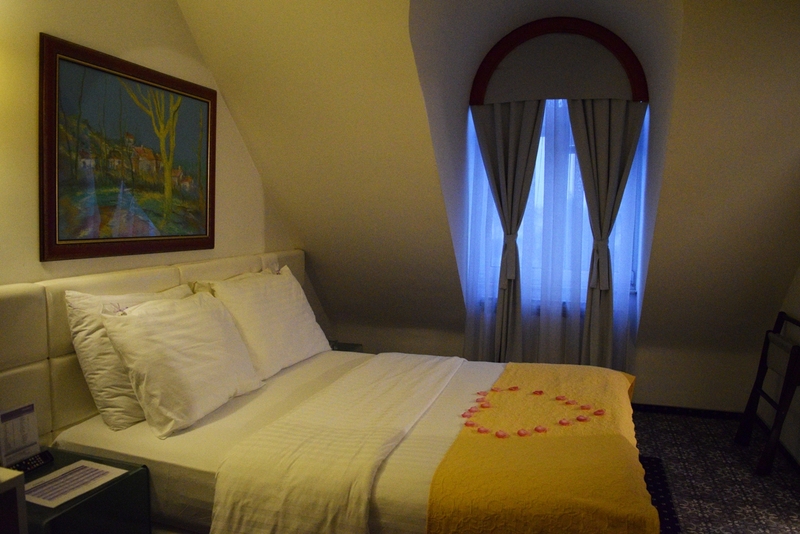 First thing we did when arriving, was checking into Phoenix Hotel, which is located a bit out of the city, in Sesvete. Entering red themed hallway, we immediately knew we chose the right place to relax a little before the holiday madness. Check-in went smoothly, thanks to a friendly receptionist. When we were driving to Zagreb, it was already dark. In a way, it was annoying but if we look at the positive side – the lights were on! 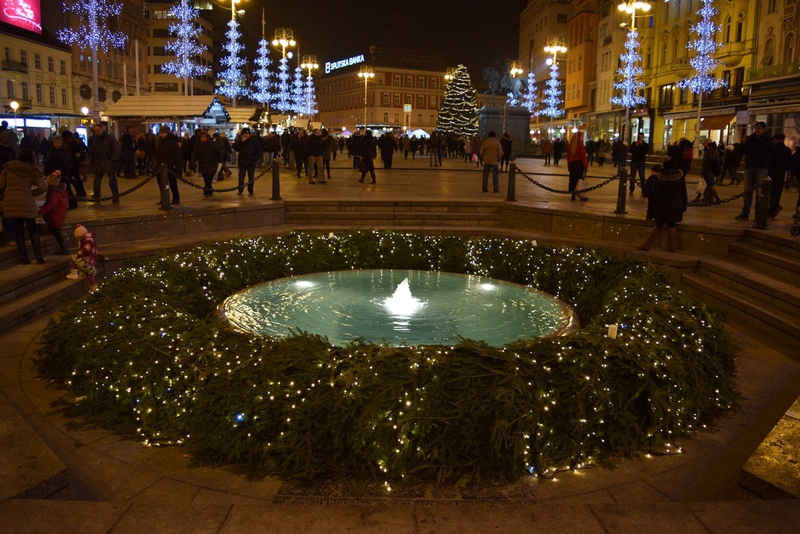 We started at Ban Jelačić Square, where a large Advent wreath is put up around the Manduševac Fountain. The fairy lights make it looks so pretty! Because I couldn’t stop taking photos there, we were moving slowlier than normal, but eventually we made it to Zrinjevac park. To get there you are required to pass by several tiny wooden houses and stolls and at this point, even if you weren’t hungrier before, you’ll be starving. Just a warning. When wandering around, we even bumped into couchsurfers that we met with for breakfast (in Ljubljana) a day before. Funny coincidence. Zrinjevac park seemed really romantic. All trees were wrapped in Christmas lights and live music was everywhere. Just a minute away, there’s King Tomislav Square, transformed into a big ice skating arena. We didn’t have time to go skating but if we did, I probably wouldn’t be writing this because I’m too clumsy. I must admit it’d be lovely to (at least) try, though. The place reminded me of the frozen lake at Frozen. Unfortunately we didn’t know about the tunnel that’s transformed into a wonderland, so we skipped that. 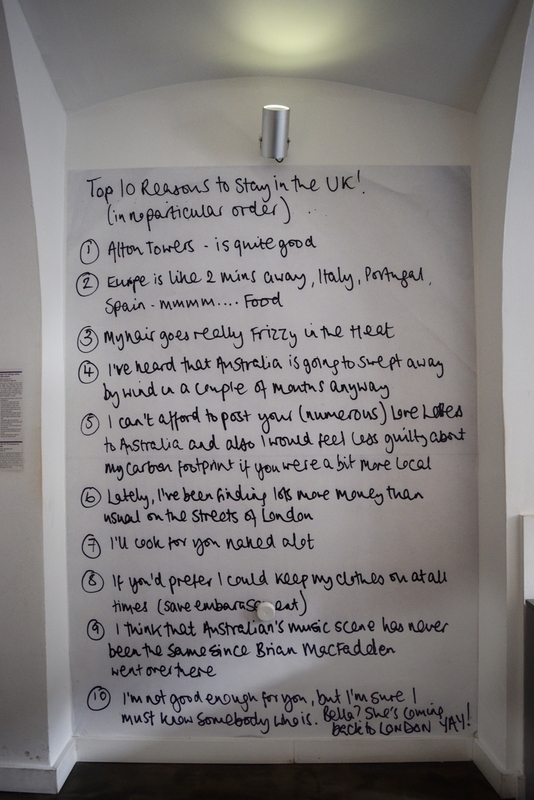 We can pretend it was our intention to leave something out so we have an excuse to return. Once we were back at the hotel, it was time for a spa. 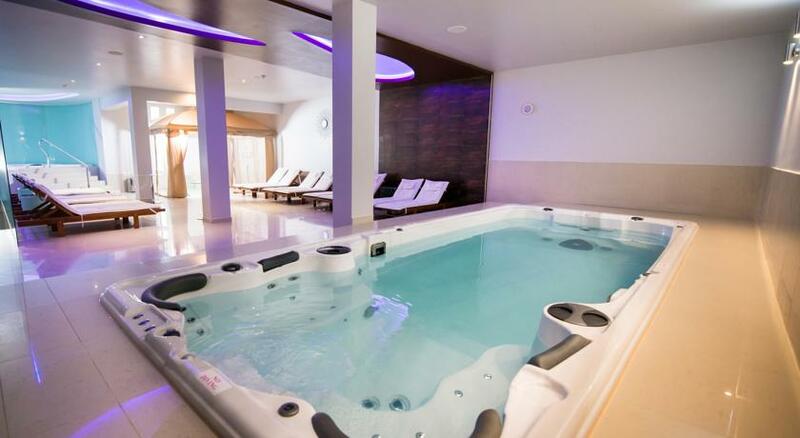 Good news for anyone that likes sauna or jacuzzi: the hotel has a wellness that’s included in the price of your room. Don’t expect to do any swimming, though. The pool (pictured below) is too tiny for that . Instead of going to bed right after, Jure went to pick up some Christmas cookies and a cup (for each) of mulled wine we got complimentary as a part of our Advent package. It was sooo good! What I really liked was that it was more than 2 small cookies, you would usually get when something is included. Each of them was different, with a different filling. We couldn’t stop stuffing ourselves til the last one was gone. Now let me tell you the secret of why I could stay at this hotel anytime: breakfast! Reading the reviews, I had low expectations. Some mentioned it was good or even great, but there were also people saying it was bad. If there’t not a single thing you like, you must be out of your mind. As a big food lover, I know quality food when I see it and oh my! You could get an omelette made just for you. They let you pick the ingredients and made it in front of you. The choice was endless. From cream cheese to jams, from cakes to cereals (can we just talk how there was a large section just for pastries? ), eggs in all forms and so much more. I could write a blog post just on that, believe me. After checking out, we drove back to Zagreb where we visited The Museum of Broken Relationship. If you haven’t heard of it before: it was founded by two Zagreb-based artists who broke up after four years. They joked about setting up a museum to house the left-over personal items, but the story did not end there. Today you can enter a beautiful crowd-funded museum for 20 KN (student) to 30 KN (regular). We highly recommended it, some stories will break your heart but it’s well worth it. All photos are mine unless otherwise started. Hi, welcome to my blog! I'm happy to see you here. My name is Ursa and I'm a part-time traveler and full-time wanderer. I've spent the last 26 years mastering the art of laughing; truth to be told, there's a high chance I'll be laughing with you at jokes nobody finds funny. Thank you for stopping by, enjoy your visit! Is Sri Lanka Cheap to Travel?